As previously reported, in aftermath of Bogdan Dinu’s knockout loss against Kubrat Pulev on March 23 at The Hangar in Costa Mesa, California – Dinu’s promoter Greg Cohen has filed a Petition for Change of Decision with the California State Athletic Commission. Citing repeated rabbit punches, including one flagrant foul while Dinu was already down on his knees, Cohen has filed a Petition for Change of Decision under rule 4 CCR – 368 of the Official California Code of Regulations, which states that the commission can change a fight’s verdict if a violation of the laws or rules and regulations governing boxing affected the result of any contest. 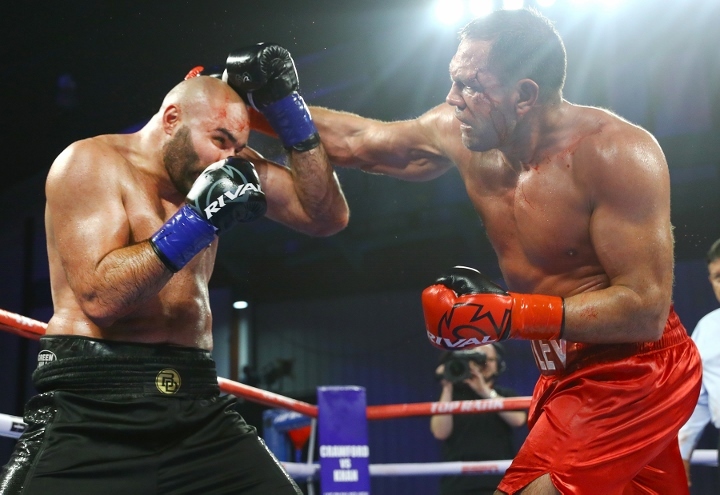 Romania’s WBA #14-rated Dinu (18-2, 14 KOs) and Bulgaria’s IBF #1- and WBC #9-rated Pulev (27-1, 14 KOs) were waging an even-on-the-cards (scores 57-57, 57-57 and 56-58) heavyweight battle when, in the seventh round, Dinu was stopped. Cohen cites in the petition documents that Pulev landed a punch behind the head to drop Dinu and then another when he was clearly down. Pulev was penalized a point by referee Raul Caiz Jr. for the flagrant foul and Dinu was given five minutes to recover, but Cohen states that the damage had been done and when the action resumed, Dinu was knocked down twice more – which Cohen says were also as a result of illegal punches to the back of the head and neck before the bout was halted at 2:40 and called a KO 7 victory for Pulev. The California commission has agreed to hear out Cohen’s request, with a hearing penciled in for May 14.